On 16th May we have seen the "Google Laser Logo" and as of today 18th May 2008) Google is displaying Walter Gropius Building Logo on Google Search Engine Page to honor & celebrating 125th Birthday of the Great German architect, Walter Gropius. It's intresting to check Google homepage daily and look for their logo's. Google has started honoring & dispalying their Logo in a innovative way. On 16th May 2008 we saw "Google Laser Logo" to honor the invention of First Laser by Theodore Harold Maiman. On 18th May 2008 Google is displaying nice architectured building logo to celebrate 125th Birthday of the Great German architect, Walter Gropius. 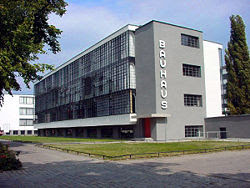 Walter Adolph Georg Gropius (May 18, 1883 – July 5, 1969) was a German architect and founder of Bauhaus who along with Ludwig Mies van der Rohe and Le Corbusier, is widely regarded as one of the pioneering masters of modern architecture and buildings. 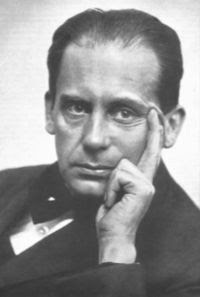 Walter Gropius (circa 1920). Photo by Louis Held. I am waiting to watch which Logo Google is going to display next. I saw the logo, but I didn't have the time on that day to track down the reference.